Your BFFs (Best Furry Friends) aren’t the only ones who want to know where you’re going! The Maricopa Association of Governments (MAG) hopes to make your future trips better by learning more about how you travel in the Valley. Whether you're driving to work, taking kids to school, going on a date, walking your dog, biking or taking transit-- your travel information is important info MAG needs to plan for our region’s future transportation needs. 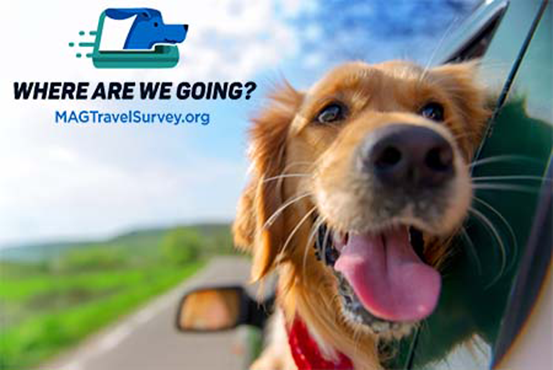 Take the survey now at MAGTravelSurvey.org/TW and get $10 for your participation! Participants will be compensated for their time while contributing to a better future for everyone in the Valley. The Maricopa Association of Governments is a Council of Governments (COG) and the designated Metropolitan Planning Organization (MPO) for regional planning in the Maricopa region. Learn more at www.azmag.gov.